It seems like I can’t bat an eye anymore without finding another 5k race. This one has costumes, that one has hot chocolate and donuts, or this one is a fundraiser for _(enter charity here)_; no matter what your motivation it seems like it’s easier to decide which date you want to run than on finding a race. However, if you live in the world of off-road running your competitive options are a bit more limited. Especially in the Midwest where when the temps drop and the mud dries up the majority of the obstacle course races head West or South. Fear not mud runners, Viking Dash is here to help fill the winter OCR blues. Choose your finisher medal. The Viking ax or sword. America Multi-Sport company. 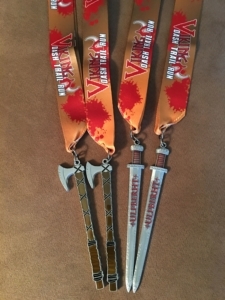 “We had been organizing road races and endurance races for years when a friend of ours from Norway suggested doing a Viking themed trail run” Tammy told me in between handing out finisher’s medals. They liked the idea and began reaching out to people in their database of racers to gauge interest. It didn’t take long to schedule a pilot race and on a cold winters day in 2013 with only 140 people on a trail in Muncie, Indiana the Viking Dash was born. What makes Viking Dash unique from other races is the “pick your distance” option. Nearly every race location offers a 5K, 10K, 15K and half marathon option to choose from. Start times stagger to break up the runners for each race and prizes go to the top three overall finishers in each distance. I loved the option to choose my race since I prefer the shorter distances. But no matter your distance, it will always be a trail run offering varying terrain and scenery. This was the first year Viking Dash was held in Southern Ohio. The course was laid out perfectly around Caesar’s Creek Lake in Waynesville, Ohio. Steve and local OCR guru Kevin Jones did a remarkable job laying out a challenging but doable course that was well marked. It wouldn’t be a Viking race without the cold, which is exactly what we got. The temp at race time was right around 30 degrees with slight wind. The cold temp had helped harden the mud from the week’s rain, but also froze the remaining water to create slick spots throughout the course. Each distance was an out and back along the same trail, which made markings easy to follow as long as you paid attention to the big sign that told you when to turn around. The trail was great with rolling hills, winding paths, and enough space to pass. The most intriguing part of the run was crossing the creek on a suspension bridge. If more than one person was running on the bridge it’s bounced like a trampoline leaving at least one person airborn a little longer than they would like. 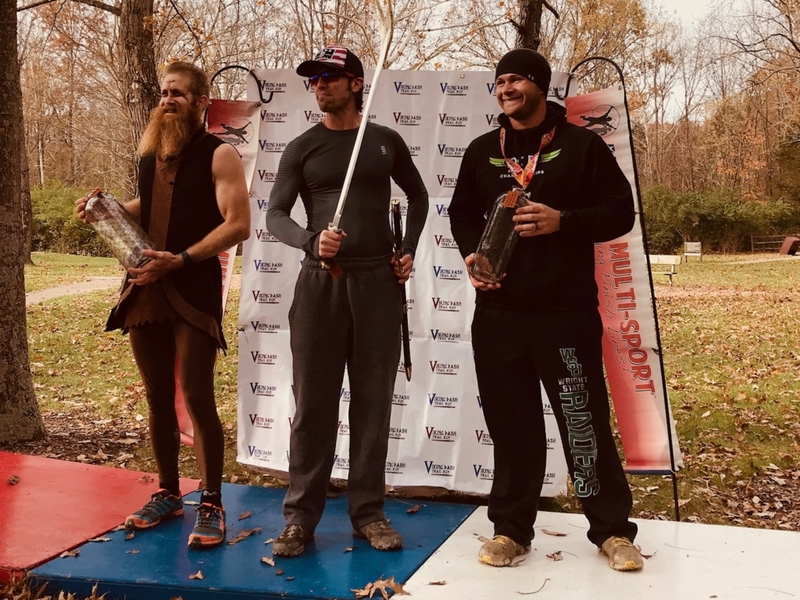 I had never done a competitive trail run outside of OCR before and thoroughly enjoyed Viking Dash. Steve and Tammy are great owners and have created a fantastic race experience from the awesome finisher’s medals to the post-race barbecue lunch. 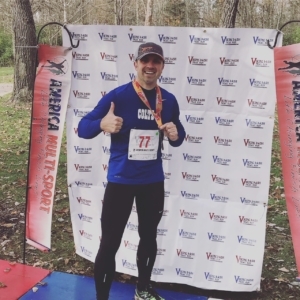 I wanted to see how my training was coming along and was pleased to finish fifth overall and first in my age group for the 5k, which earned me an invitation to the Viking Dash Championships in February. If you’re like me and sad to see the OCR season end as you settle into off-season training, I can’t recommend jumping into a Viking Dash enough. You have great hands-on owners who care about their product and the athletes. “It’s amazing how fast this thing has grown,” Steve told me afterward. “Our first couple of years we only did two races; then four. This year we had 9 races between Indiana, Kentucky, Illinois, and Ohio. Next year we’ll be licensing to promoters outside the Midwest to have 27 Viking Dash locations around the US.” The next race is coming up in Chicago on December 9 and the National Championships in Muncie, Indiana on February 17. Ben is an ACE certified personal trainer and head coach at Orangetheory Fitness in Miamisburg, Ohio. He's been participating in obstacle course races since 2012.